Anterior open bite is an abnormal condition that is caused by dental, skeletal, functional, and pathological factors in dental arches and jaws. An adult woman having Class I relationship on the right side, Class II relationship on the left side and severe anterior open bite with inadequate maxillary incisor exposure demanded treatment without surgical approach. Treatment was performed with preadjusted edgewise appliances accompanying extraction of maxillary left first premolar. As a result, open bite abnormality was treated with satisfactory esthetic outcome coupled with an ideal overjet and overbite relationship. Anterior open bite, adult case, nonsurgical approach, orthodontic treatment. Kim YH, Han UK, Lim DD, Serraon ML. Stability of anterior openbite correction with multiloop edgewise archwire therapy: A cephalometric follow-up study. Am J Orthod Dentofacial Orthop 2000;118:43-54. Kim YH. Anterior openbite and its treatment with multiloop edgewise archwire. Angle Orthod 1987;57:290-321. Rinchuse DJ. Vertical elastics for correction of anterior open bite. J Clin Orthod 1994;28:284. Kucukkeles N, Acar A, Demirkaya AA, Evrenol B, Enacar A. Cephalometric evaluation of open bite treatment with NiTi arch wires and anterior elastics. Am J Orthod Dentofacial Orthop 1999;116:555-562. Enacar A, Ugur T, Toroglu S. A method for correction of openbite. J Clin Orthod 1996;30:43-48. Huang GJ, Drangsholt M. Stability of anterior open bite correction with MEAW. Am J Orthod Dentofacial Orthop 2001;119:14A. Endo T, Kojima K, Kobayashi Y, Shimooka S. Cephalometric evaluation of anterior open-bite nonextraction treatment, using multiloop edgewise archwire therapy. Odontology 2006;94:51-58. Kuster R, Ingervall B. The effect of treatment of skeletalopen bite with two types of bite-blocks. Eur J Orthod 1992;14:489-499. Gurton AU, Akin E, Karacay S. Initial intrusion of the molars in the treatment of anterior open bite malocclusions in growing patients. Angle Orthod 2004;74:454-464. Subtelny JD, Sakuda M. Open-bite: diagnosis and treatment. Am J Orthod 1964;50:337-358. Sherwood KH, Burch JG, Thompson WJ. Closing anterior open bites by intruding molars with titanium miniplate anchorage. Am J Orthod Dentofacial Orthop 2002;122:593-600. Kuroda S, Sakai Y, Tamamura N, Deguchi T, Takano-Yamamoto T. Treatment of severe anterior open bite with skeletal anchorage in adults: comparison with orthognathic surgery outcomes. Am J Orthod Dentofacial Orthop 2007;132:599-605. Beane RA Jr. Nonsurgical management of the anterior open bite: A review of the options. Semin Orthod 1999;5:275-83. How to cite this article: Secil Cehreli, Burcak Kaya. Th e orthodontic treatment and one year follow up of adult case with severe openbite. Cumhuriyet Dent J 2014;17 (Supp 1):1-6. 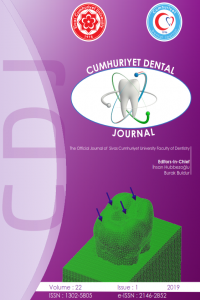 Cumhuriyet Dental Journal is licensed under a Creative Commons Attribution-Gayriticari-NoDerivs 3.0 Unported Licence.